Countless people who are living lives compromised by disabling habits like abuse of alcohol and drugs, overeating and poor nutrition, smoking, and inactivity, have James O. Prochaska and and Carlo DiClemente to thank for revealing how people change. And how they can change. Starting in the late 1970s, and culminating in their breakthrough book in 1984 titled The Stages of Change, James O. Prochaska and Carlo DiClemente developed and revealed a model of change that was agnostic to the many schools of psychotherapy that had emerged in the past millennium. Using the existing, prevalent therapies as a platform they identified six stages by which we humans change. This was far more than a fine academic contribution: It was a method to diagnose, if you will, where someone was in the dynamic process of change—and thereby make phase specific efforts, later informed my specific techniques, to enable a person to move beyond a life of adverse consequences and impairment for that person, and thereby contribute to those close to them and our societies (which bear the costs of problem behaviors). Seventy percent of the chronic diseases in this country are fostered by the habits noted above. Perhaps one of the best examples of how their model of change was made highly practical is the work of Dr. William Miller. With his colleague, Stephen Rollnick, they made a seminal contribution to the public’s health and mental health with their 2002 book, Motivational Interviewing: Preparing People for Change (2nd Ed.). MI, as it has come to be called, began with addiction problems but now is very common in mental health and primary medical care practices, for, of course, problem behaviors dominate every one of those fields. And its use has been adopted not just by doctors but also by nurses, case managers, and even supportive family. By the way, should you not have them handy or question their sequence, the six stages are: precontemplation (not ready); contemplation (getting ready); preparation (within a month of taking action); action; maintenance; and finally termination (confident there will be no relapse). Talking to somebody about taking action, for example setting a date to quit smoking, who is in the precontemplation phase not only does not work, it can drive them further away from taking later action. 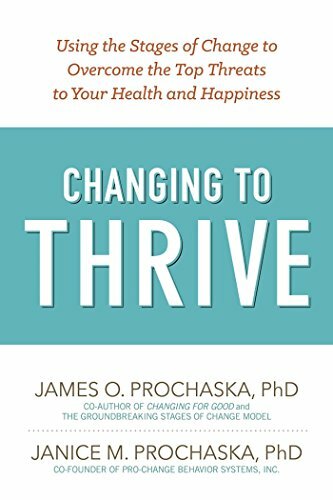 In 1994, Dr. Prochaska gave us another change book, Changing for Good, which sold very well. He has received considerable federal grant support to further develop knowledge about the science of change, as well as his becoming a valued consultant to varied industries. And now, we have the sequel to the 1994 book called Changing to Thrive, and written with his wife, they put so much of the theory and practice together in one volume. They maintain, from studies and experience, that changing multiple behaviors at the same time (like smoking, eating, and inactivity) is not only possible but the activation energy needed is little more than altering one alone—and of course, the benefits are of orders of magnitude greater. The authors, in Changing to Thrive, weave in another problem, ubiquitous as it is, namely stress. Not only does chronic stress do significant damage of its own it serves as a powerful trigger to the collection of unregulated, illness making behaviors that produce the lion's share of morbidity and mortality in developed countries. If you read their new book, start by looking at Figure 3 on page 84. The complex framework the authors elaborated in the preceding pages is a lot to digest, and this graphic sort of sums it up—and helps a reader to navigate the material. If this book goes onto additional editions, they may want to place the figure earlier for the reader's sake. There are also chapter-concluding paragraphs that concisely and clearly make the key points they have delivered. These too might find more utility at the beginning of the chapter or section. Once we get past the first part of the book there are four chapters, one each on smoking, problem drinking, problem eating (too much and bad stuff), and inactivity. These are like workbooks that can be read and followed on their own. Each reveals that accenting consequences to a person seeking change is not as powerful, or enduring, as engaging them on what their "big picture" of life is, namely what they may seek in terms of a life well lived in relationships and work, in self-regard, financial benefits, and longevity. The scope of this book is impressive and admirable, from understanding the stages of change to its robust collection of "Principles of Progress," and then blending the two. But who do they mean their reader to be? Fellow academics can appreciate their countless test exercises, checklists, and lengthy lists of pros and cons—all meant to be completed by patients and used by clinicians. But a person smoking two packs a day and spending every evening on the couch eating junk food will likely get lost in the maze of the material. The authors know so much and have such vast experience; these great virtues can at the same time make them less accessible to an educated lay person, rather than to a trained professional. This book is a welcome refresher course in human psychology and how we can change. It provides a trove of tools to use in guiding a patient through change. We ought to thank the authors for giving us all so much toward the thriving we all clearly seek.